The Office of the Vice President for Budget and Finance manages budget policy and planning, and ensures that the university is an effective steward of financial resources. Staff works with the President, Board of Regents and campus leadership to direct university funds toward programs and initiatives that best promote CU's mission. The office works with policy makers, stakeholders and the general public to communicate the opportunities and challenges the university incorporates into its fiscal planning. 2018-19 Fast Facts This presentation includes a series of charts illustrating historical trends in enrollment, student diversity, state support, administrative expenditures, and research funding. It also provides comparative data on tuition rates, state support, faculty salaries, degrees awarded, and student success measures. Cost Drivers at CU This presentation was presented to the University of Colorado Board of Regents in July 2016. It includes analyses of expenditures and revenues, changing enrollment patterns, as well as student and employee history. 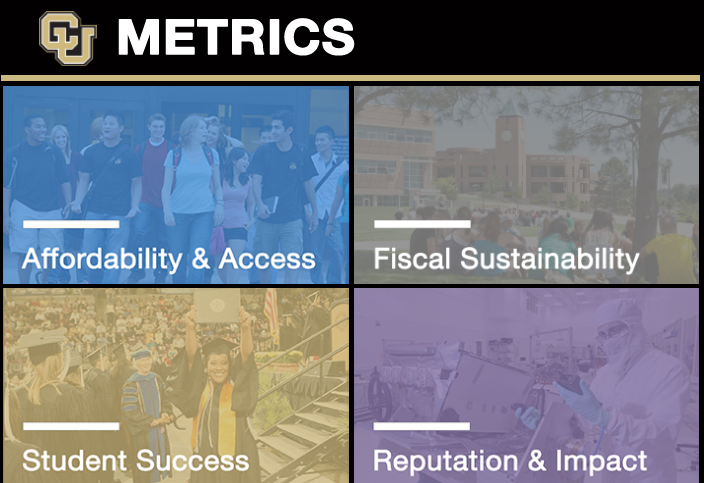 CU Data Made Simple University of Colorado System data for all campuses summarizing student enrollment and outcome measures, faculty and staff, budget and finance, capital assets, and sponsored research. The Office of the Vice President for Budget and Finance includes three primary units: Budget and Finance Office, Business Operations, and the University Treasurer. This office assists the Board of Regents, executive management team, and the university community in attaining their goals by compiling and sharing information for planning, budgeting, and management. This office provides important financial and service functions to the university including accounting, procurement, and risk management that helps lower the university's administrative costs. This office actively stewards and manages the financial resources of the University on behalf of the CU Board of Regents and support of the faculty, staff, and students of the university. For information on the Board of Regents Budget & Finance Committee, organizational chart, and contact information for the Budget & Finance staff. There is no VP Budget and Finance and Chief Financial Officer forms. There is no VP Budget and Finance and Chief Financial Officer FAQs. There is no VP Budget and Finance and Chief Financial Officer events. There are no VP Budget and Finance and Chief Financial Officer blog posts.